The name of Chemours is synonymous with the name Teflon®, however, it must be remembered that Teflon® is a brand name and not a product. The Teflon® trademark was coined in by Chemours and registered in 1945, the first products were sold commercially under the trademark at the start of 1946. Applications and product innovations grew quickly. Today, the family of Teflon® fluoropolymers from Chemours consists of: PTFE, the original resin; FEP, introduced in1960; Tefzel® ETFE in 1970; and PFA in 1972. 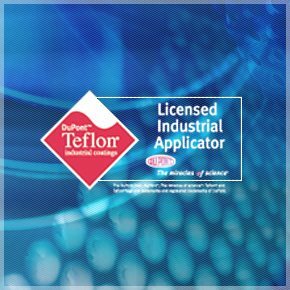 The story of Teflon® began back in 1938 at Chemours’s Jackson Laboratory in New Jersey with a chemist Dr Roy Plunkett (1911-1994), who was working with refrigerants and discovered PFTE as a by product of another experiment, and so PTFE was born. PTFE revolutionized the plastics industry and in turn offered limitless applications to the engineering world and beyond. Chemours fluoropolymers have become indispensable to engineers in all disciplines manufacturing and science. PTFE is inert to virtually all chemicals and is considered the most slippery material in existence. These properties have made it one of the most valuable and versatile technologies ever invented, contributing to significant advancements in areas such as aerospace, communications industrial processes and even to bakeware and cookware. Chemours fluoropolymer coating are available in both powder and liquid forms. The versatalility of these coatings allow almost unlimited application to a wide variety of part sizes and configurations and adding value that goes beyond the inherent non-stick qualities. Chemours Teflon® PTFE (polytetrafluoroethylene) aqueous dispersions are milky white dispersions of PTFE particles in water, stabilized by wetting agents. They can be further formulated to meet specific needs by adding other solid or liquid ingredients. These aqueous dispersions offer a practical method for coating or impregnating using a resin that does not respond to traditional solvent or melt-processing techniques.